We are now a local area dealer for Carrier Heating and Cooling Products. In addition, our vendor relationships allow us to work with many other energy systems (View All Brands). As a small locally owned business, our low overhead allows us to pass our cost SAVINGS directly on to you! Unlike single-stage furnaces that create noticeable temperature swings by heating up and cooling down quickly, the SmartComfort EC 97 delivers consistent heat and overall comfort. The sturdy steel cabinet is thermal lined and insulated to reduce operating noise. The heart of every furnace is the heat exchanger. The proven RPJ®(Rigid Press Joint) heat exchanger is designed to move more heat to the outside surface for increased heat transfer. Up to 16.5 SEER efficiency for energy cost savings. Quieter operation than a typical hair dryer. Even in the most affordable line of central air conditioners, homeowners get advanced engineering and performance. 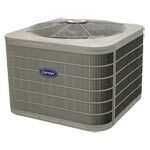 Efficient to operate, they’re quiet and smooth running, and deliver the reliable home comfort you expect. Their low initial cost will surprise you, and you’ll have the assurance of knowing that you have legendary Carrier AC equipment to keep your home cool during our hot, humid summers. Available in 24ABB and 24ABC Models. High-efficiency performance, up to 18 SEER, saves on energy bills. You’ll enjoy the highest energy efficiency, quiet operation, and lasting, reliable performance with a Performance Series model. Models are available in a wide range of capacities to suit any home, Our Minnesota air conditioning company is proud to recommend the Performance series systems for any residential use, because we know that they provide the comfort our customers demand with the value they expect. Available in 24ACB and 38HDR Models. Maximum efficiency, up to 21 SEER, for top energy savings. Super quiet operation and available two-stage compressor. 10-year limited factory parts warranty. 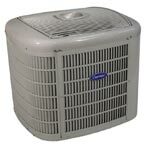 Maximum performance, top efficiency ratings, super-quiet operation, and advanced controls are just some of the features of Carrier’s top-of-the-line central air conditioners. As the leading Minneapolis St. Paul air conditioning contractor, we have installed Infinity systems for discerning customers throughout the Twin Cities metro area. When combined with an Infinity gas furnace, your family’s maximum comfort throughout the year is assured. Available in 24ANB Models. Performance™ Series Gas Furnaces Efficient, quiet, flexible and durable, these powerful furnaces live up to their Performance name every day—no matter where you live. Infinity® Series Gas Furnaces Whether you live in the cold North and need the high-efficiency of a condensing gas furnace or the moderate South and can do just fine with a little less efficiency, you’ll still enjoy ultimate comfort with these Infinity series furnaces.